In search of a natural type of dog, able to accompany us in our way of living and our activities, we came upon the Laika. The West Siberian Laika is, if his owner is provided with the same qualities, stable, friendly, active and loyal company. He sheds (twice a year), barks, you have to keep him busy, he keeps you busy, costs a lot of time and energy but…. to us, he is definetly worth it! Not suited for people who work fulltime away from home, when the dog has to be fulltime alone or in a kennel. A suited dog for people, who allow their dog to be part of their life and familie, and who like an active outdoor life. 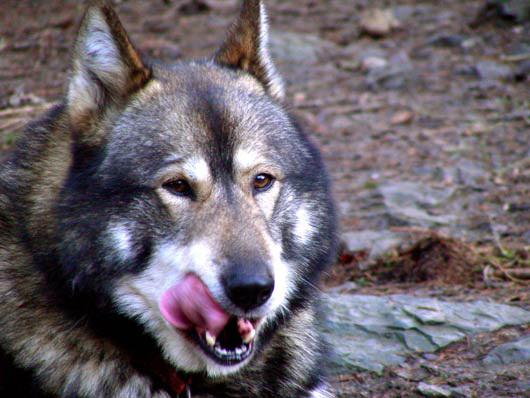 The West Siberian Laika is not a wolf dog. The theory that our dogs are descendants of wolves is strongly being questioned. Nowadays mixed breeds with wolves are artificial and have negative results for the use of dogs as pets as well as working dogs. 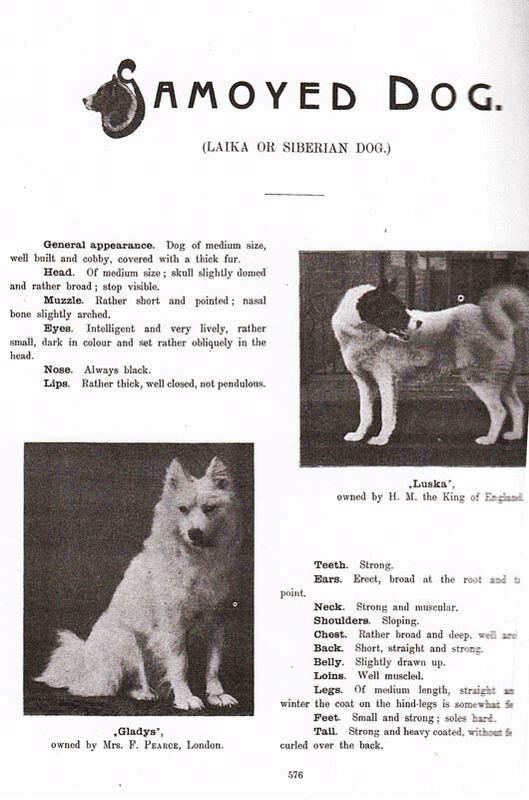 The West Siberian Laika is not a new breed. At this moment there are more than 300 officially recognized (FCI) breeds, wich are often developed by selection and use through centuries. So if you put in some effort anyone can find a suitable breed. For those who prefer mixbreeds there are ( I feel very sorry for them) lots of super nice dogs in refuges. The creating of a new breed is therefor not necessary, and often is only used to create a new look or fashion. The Laika is a very original dog type, formed by a natural way of living and harsh climatological circumstances. The exterior of the Laika is mainly not selected by humans, but formed by nature. The working capacities and the character of the Laika are formed by working and living together with human beings ever since the prehistoric time. This is how the Laika became a maximum of nature in a maximum of dog. The following text is a portrait from the West Siberian Laika, published in the official kennelclub magazine in the Netherlands ‘De hondenwereld‘ year 62 number 3 2007. We provided information for the text and pictures of our dogs where chosen amongst nearly 200 Laika pictures. Our information has also been used for the Dutch magazine ‘Onze Hond‘, magazine ‘Kat en Hond‘, German magazine ‘Hunde revu’ (were Chris had a column). And photographs of our dogs are used in several encyclopaedia like:’ Lekturama’, ‘Toepoels hondenencyclopedie‘, the ‘Larousse’, de ‘grote Hondenencyclopedie’ from Esther Verhoef and other dog books. Our dogs even were on National tv in an animal program. The information from West Siberian Laika we have, we got by having Russian literature translated, interviewing many people like; experienced Laika-owners, breeders, hunters and people in any kind of way living together, or having experience with West Siberian Laiki. We want to thank them all for their time and effort, with special thanks to Beatrice Izacova and Anna Luchekina. We only publish the most relevant information, in an effort not to make the text to long and unreadable. The name laika actually is not a breed-name but comes from the word ‘Lajatj’, which means bark. This is synonymus for dog; The Laika is the most common indigenous dog in Russia. As long as mankind can remember the Laika is a dog that lives together with mankind and works as hunter, sleddog, livestock guardian etc. Due to different use and geographical situations, many types of Laika have developed with different characters, working abilities and exterior. The Laika was very important for the Siberian people. Without this useful dogs, they could not survive under the harsh climatic-circumstances. Vikings took Laiki-type dogs back home to Scandinavia from their travel throug Russia. This is how Laiki-type dogs spread through Europe ( DNA of our firts import dogs was used to compare with nowadays Scandinavian breeds, by the University of Utrecht). The same thing happened along the Beringstreet in Northern America. In Russia, the land of origin of the Laika breeds, every region had before the all-union-congress of Moscow in 1947, his own Laika-type dogs. Although all these breeds had different names according to geographical circumstances or name of people that lived with them, they often were not very different in exterior or working qualities. Karelian Finnish Laika: The smallest of all six, is comperable in exterior and use, with the FinnenSpitz (FCI breed). It’s a very lively active dog with a very active voice! It has a beautifull foxred color and is mainly used to hunt birds. It has an very independant nature and is the most active of all Laiki. The Nenezker Laika: Also called Samoyeed Laika, named after the nomadic herdsmen that herd reindeer in the north of Russia, the Samen. These dogs are the origin of the nowadays called Samoyeed dogs. Miss Kilbourn Scott (who travelled with her husband to Russia) took home to England only the white dogs and selected further to the current Samoyeed. The original Nenezker Laika were not only white, but often black and white or all black. They are the helpers of the herdsman in guarding and herding the reindeerherds. They were also used as hunting companion, but in contrary to what many people nowadays think, they were seldom used as sled dogs. For that use the Samen used reindeer. The Jezdoraja Laika is manly seen in the north east of Siberia, under very harsh climatic circumstances. They are a heavy type of sled dogs with a not very uniform exterior. They are manly used as freight dogs for pulling heavy weights, and only selected by their working capacities. The Russian European Laika is the most active of the 3 FCI recognized Laiki. The exterior, behavior and the use, show much in common with the Karelian beardog. The Russian European Laika is a bit more elegant build compared to the Karelian, especially in the head. Most common color is black and white, but they can have other colours like different types of gray. It is an independent dog and has often a tendency to agressive behaviour. He has quarding qualities and the effective use of his voice, makes him very beloved by Russian hunters. The West Siberian Laika is the most allround Laika. Therefore is so widely spread not only in Russia, but also outside Russia. He is the most common Laika-type. The West Siberian Laika is an elegant, active dog with a loud voice. All colors and markings are allowed. It depends on how the dog is used what colors are preferred, and there are of course some myths and personal favours. More than any other type of Laika you find him, due to his pleasant character, also in Russia as a family and companion dog. The East Siberian laika, is a bit heavier build than the West Siberian. They can have the same size, but mostly the East Siberian is a bit higher. The face-expression of the east Siberian Laika is remarkably different from the West Siberian Laika. Their scull is rounder, their ears are broader positioned and have a rounder shape, and together with their rounder eyes they have a very different expression compared to the West Siberian Laika, who has high set, triangle shape ears and wolf like almond shaped eyes, which are preferable dark of color! Also the tail can be quite different and is often not as strongly curled as the West Siberian, but tips their back. The most common colours of the East Siberian are dark, but other colors exist too, even white. They appear to be more independent than the West Siberian. His original task is pulling the sled, guard and hunt, manly used for big game. Of these six Laika-breeds, nowadays three are FCI (federation Cynologique International) recognized: The Russian European Laika, The West Siberian Laika and the East Siberian Laika. These 3 are categorized with Spitz and polardogs as huntingdog, but land of origin mentions that a strong separation of hunting and sleddogs is not possible with these breeds, and they have to be able to be used for more than one task. In the following text we will concentrate on the West Siberian Laika. Because Laika-type dogs lived together with humans ever since prehistoric times, there is not much known about the very beginning. The information on the historical development consists of archeological material and data of people which mention the dogtypes living together with people, they encountered when traveling around Siberia. Stories about people working and living with Laiki-type dogs and how important and how these dogs were appreciated by the indigenous people. There are stories about people sharing their milk with dogpuppies and dogs keeping the children warm in the hut or tent. These dogs were the dogs of different nomadic people, hunters, fishers and herdsmen. Also nowadays we saw them living together with their people, sharing huts and tents and being good taken care of. We met lots of very friendly Laiki, living together with very friendly Siberian people. His popularity the West Siberian Laika ows to his strong constitution and allround working possibilities. His ‘homeland’ the north Oural and West Siberia, but also outside these areas they are well represented. The standard of the West Siberian Laika is develloped by combining diffrent type of Laiki from different local people and geographical areas. Coming from the Mansijskaja people and Chanteiskaja people and dogs from Oural area. They al had lots of comin in size, colour, karakter and use. The Mansijskaja Laika was lighter build, had not much stop, a more narrow head, longer muzzle and less coat, they did often not have the typical withers. The Chanteiskaja Laika was heavier, had a broader scul, some stop, a shorter muzzle and had a thick rich coat with a good develloped collar and typical wisthers (see pictures of our Borr here below). Nowadays West Siberian Laika is a mixture of these diffrent types, in wich we often still see the origine of the diffrent laika-types. The hight of the withers varies from 52 cm till 60 cm. (standard max. height), but in Siberia this used to be even till 58-64 cm. The hunters thought that it depended on the clima sircumstances and hunted prey, that sometimes bigger sizes were in favor, untill sometimes 69 cm. They also shared the opinion that a good dog should not be excluded from breeding because of his size. In 1979 on the Allunion- congress they put the official hight on 62 cm. wich was not of much influence. Since the beginning of the twentys in last century,Russia had a highdevolloped professinal breeding of West Siberian Laiki in Sverdosk. An importend stockholder is the dog Grozniej (1932) who’s blood is still in nowadays Laiki by his grandson Taeznic of kennel ‘red star’. Later also Moscow breeding became very important by the male Miska of kennel ‘Vsekohotsjuza’. Together with the female Taiga from huntingsociety ‘Ivanov’, they had magificant offspring. During war the descendants of these dogs were taken away from the industrial areas. In that way they became founders of different bloodlines, so they can be found not only in Moscow descendants. 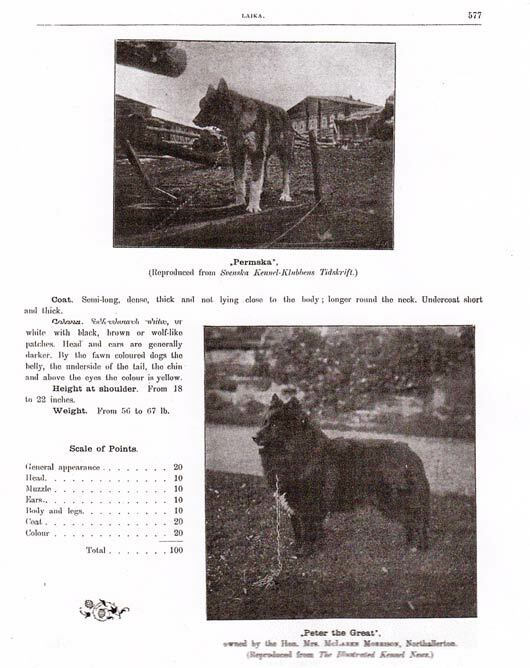 During this period also dogs from outside Moscow were were taken into the professional kennels, often original dogs from Siberia sometimes without pedigrees. All professional kennels had a very organized structure an strong breeding rules. Many breeders tried to mix defferent types of West Siberian Laika, to combine different karakteristics. On the other hand there were also some breeders and hunters who highly appreciated the individual qualities of the Chanteiskaja and Mansijskaja dogs and tried to keep this different chractaristics. At the end of the seventies (last century), there were about 15 000 Laiki in Russia. In 1978 on the fifthiest anniversay of the big dogexhebition in Moscow, there were 340 West Siberian Laika participating, of wich half of them got hte qualification excellent. This is extreemly high for a working breed. The West Siberian Laika has excellent exterior and working capacities and still plays an importand role in the national dogscene. Until 1992, pfficial breeding (reed with official pedigree) was almost only possible in state compagnies from the ministry of hunting and fishing. In these compagnies, were kennel, hunting area, trainingsarea ands. here the dogs were bred, trained and tested. They went to their new owners who trained them and worked with them and did official huntingtests. Nowadays there are lots of privat breeders having official kennels. Al through the years West Siberian Laika has also been bred like they were from ancient times, without pedigree, selecrted by nature and human use. By people who still live in nature and have no interest in pedigree, they just want to have good ofspring of their good Laika. This is how the breed develloped from ancient times, and I hope for the well beimng of the dogs and the people who live with them, that also this kind of breeding and living can keep on exsisting in the future. Because of his original task as huntingdog, the West Siberian Laika must be highly intelligent and have a excellent condition and a lot of courage. Also because of this, they have been succesfully used as armydogs, messengers, helpers and rescue-dogs. Also as guardian dog and sleddog they have been succesfully used. A West Siberian Laika is active and has a lot of energy, he has an excellent sence of orientation. He is obiedient and has (compared to other nordic dogs) will to please. Like any nature breed he has a good huntingscills. He is not suited for leading blind people because he is to vivid, but he is very suited as compagnion dog for people who have time for their dog, want to live with him and give him an suited education. He can make an excellent friend an is good compagny for children (never let little children alone, without an adult, with a dog). He can be trained for different type of work, and loves to be active with his owner. 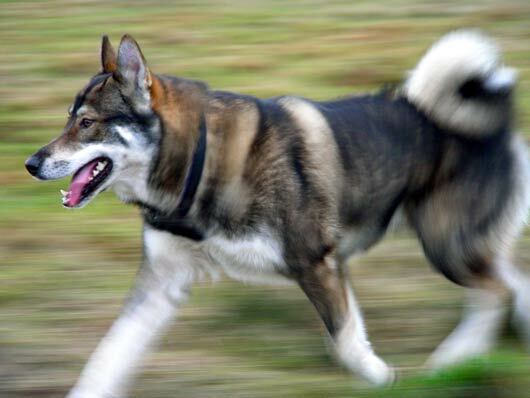 When hunting the West Siberian laika can walk till 80 km a day. He hunts by nose, sight and ears and uses all his well developed senses. He can follow a track silently and once found, keeps the game at bay, while barking, in place until the hunter arrives. He circles around the game and barks at the same time, this irritates the game, which is concentrated on the dog and does not notice the hunter approaching. It’s obvious given the size of some game, the dogs must be agile and intelligent, to avoid being attacked. Some types of hunting demand very different disciplines of the dogs. For example a type of very specialized duck hunting in which the dog must sit very still, wait for a sign of the hunter and than lour the ducks towards the hunter, through the inquisitive behavior of the ducks. Also must the dog retrieve out of the water. Hunting big game is not without danger. Therefore good training, practical use and hunting tests are valued. The danger exists that hunting tests, like with other hunting breeds, are overvalued in relation to practical use. This means that breeding is more and more focused on dogs that are too aggressive, and less attention is paid too obedience,” will to please” and intelligence. The result is a dog that might be spectacular to watch but in practical use can easily be hurt, or even killed during the hunt. It is up to an intelligent Laika to estimate what is needed to keep a dangerous animal at bay, and no more then that. In Siberia a dog is not allowed to hunt in neighbours hunting grounds and should keep in regular contact with the hunter. Use of telemetry is not needed and even unwanted, as otherwise breeding is no longer focused on this the typical laika characteristic; the regular eye – smell and sound contact with the hunter, and the dogs would become to independent. To think that a Laika is a hunting dog and thus is permitted to run any time after all game is a misunderstanding. It would be, for example, very unpractical that while hunting wild boar, the dog would run after the first hair track he meets. Also in Siberia Siberian people value highly when a dog is obedient and has will to please. Like mentioned before the dog must stay in contact with the hunter and is not allowed to go of hunting in a neighbour’s territory. In Siberia, being afraid, being aggressive and running of, is all three not accepted for a dog. In different countries, different demands are put to a West Siberian Laika, depending also from traditions, use and possibilities. In Scandinavia for example, the dogs get very much liberty and contact with the hunter is, like with Scandinavian breeds like elkhound and jamthund, finnenspitz, minimalized. The dogs often live in kennels, and are let of leash to hunt, and independency is stimulated. Telemetry is used to track the dogs, and they do not select on obedient with breeding. In Hungaria for example, hunting tests contain much more tests of obedient and will to please. Items like tracking of leash and keeping game at bay are followed by heeling of leash while walking next to the hunter who walks through the hunting area. In Russia hunting and hunting tests are combined, but more and more the tests have the tendency for being over valued. Indigenous people in Siberia still use the Laika as a practical working dog, selecting also for this use. Depending of the type of game, the hunter uses one or more Laiki. The West Siberian Laika is not a specialized hunting dog, but can be used for different disciplines like, tracking, retrieving (also out of the water), and baying. Because of that he is very popular amongst hunters. During the hunt the west Siberian Laika walks of leash, but keeps in contact with his hunter. This doesn’t mean the dog is always in sight. The West Siberian Laika keeps us better in ‘sight’ than we can keep him in sight. Also during dog walks he is often out of sight, but after calling him he appears surprisingly nearby out of the bushes. Although the West Siberian Laika can heel very well if we learn him to, we must not hinder him with our shortcomings. He sees, hears, smell everything we don’t and is very handy and fast. If we have a good relationship with our West Siberian Laika, and trust him, together we can enjoy nature and can we discover more, because we are in the company of our dog. The West Siberian Laika is an all-rounder and suited for many different tasks, which he can combine surprisingly well. If people are looking for a specialist for one specific task, it is better to look for another breed. ( for example: as tracking dogs, the St. Hubertus bloodhound or the Hannoveraner is a much better choice, as retriever it is more logical to choose a Labrador etc.). Although there really are Laiki with a specialism, in general his power is his universal possibilities. He is the ‘handy-man’. In additional use as an hunting dog, the West Siberian Laika can be trained as tracking dog. 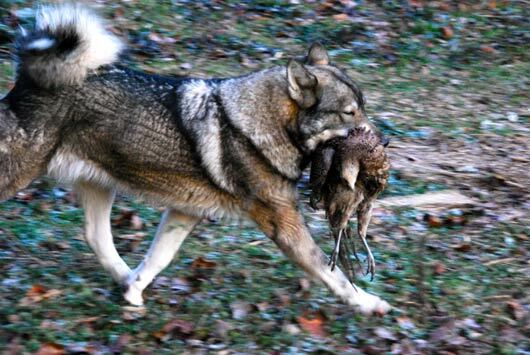 If game is not shot properly or hurt by traffic, a West Siberian Laika can follow a bloodtrack to find the wounded game so it can be shot so the suffering stops. Pioniers in Western Europe were the before mentioned Tom and Taiga (and Jarky and Tuman) from our kennel. They turned out to be talented tracking dogs. In the Netherlands more people and dogs followed their footsteps and are training for blood tracks. It’s a pity that the criteria for the certificates they get in clubs, are not very useful in practice. If this would be the only occupation for the West Siberian Laika, these short tracks (official 500 meters) on leash, would not be sufficient action. In combination with other activities this is a very nice way to be busy outside with your Laika. The male Arctic Legend Biryook, of the same kennel as Tom and Taiga, was the first and till now (2010) the only West Siberian Laika on the official tracking list in the Netherlands. He was invited many times (nationally and internationally) to work as tracking dog. And he did this very successful since he was 10 month old until twelve years old. Apart from that, Biryook accompanied us very often when horseback riding, walking of leash through the area were he also was hunting and during winter was our lead dog for the sled. He is a good example for the polyvalent use of the West Siberian Laika. 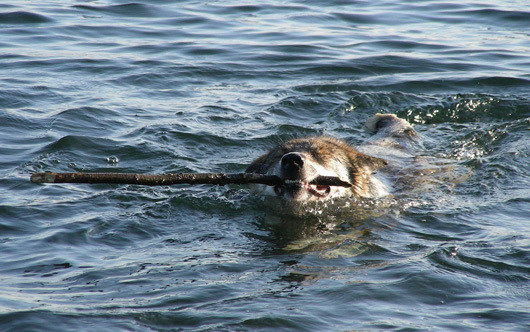 Apart from hunting the West Siberian Laika can also be used for other activities. 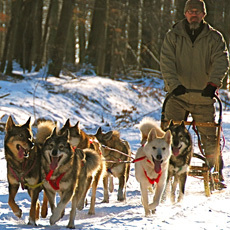 The dogs turn out to have excellent qualities and natural talents for sled dog activities. They are reliable and intelligent, and often very suited as lead dogs. They learn fast can cope with stress and love to work. At races the sled dog team of Arctic Legend, was surprisingly fast. During tours with many sled teams, the dogs of this kennel turned out to be excellent trailbreakers and very reliable in many situations. The West Siberian Laika is saved from the true fanatic race spirit. They are not suited to live like Husky’s outside in kennels or on leash. They are not like these pack dogs, which can also enjoy life with minimum of human contact. The West Siberian laika needs to live with humans and needs his activity also in summer. But that their original task contains also this discipline is obvious, by their talents and fun showing when pulling sleds. 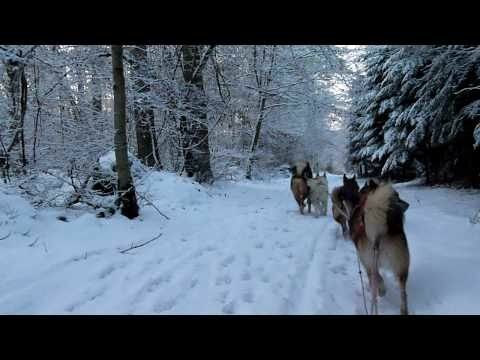 In the sled team of Arctic legend again Tom and Taiga were pioneers in Europe. Tom was only very enthousiastic when going homewards. But taiga was very talented and reliable. Their offspring joined this team and in that way more owners learned they joy of sledding and got their dogs trained. The West Siberian laika is an excellent pupil at the dog school. He learns easy and fast, but because of that, can be bored very fast too. He does not see the use of boringly long doing the same trick over and over again, and will refuse to do it, if you do not make it attractive, by training not to long and changing subject in time. Agility is very suited for a west siberian laika, because of the action and fun. It is a good way to learn your laika to be obedient while playing. At this moment there are also West Siberian Laiki experienced active in Breitensport, rescue dogs and tracking (human senct). The West Siberian Laika has to make kilometes, and is not suited for making a little ten minutes walk on leash, three times a day. He must be able to run of leash have long walks and play a lot. With humans and with other dogs as well. To satisfy his need of action he can also easily accompany you at you bicycle-rides. As primitive and still natural dog type, the West Siberian Laika has a strong constitution and is rarely ill. He adapts excellent to our climate and does not suffer from heat or cold ( the Siberian climate can give minus 70 Celsius during winter, but 40 Celsius plus in summer). 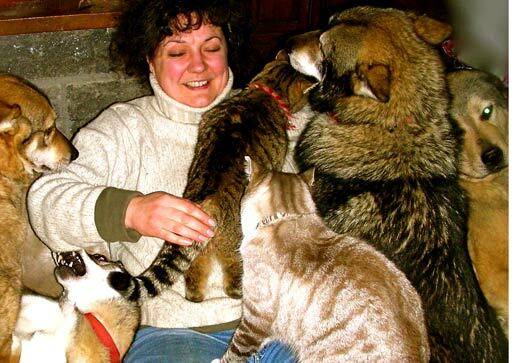 Weve known of West Siberian Laiki surviving snake bites, poisonings , illnesses and wounds, that would have been fatal to other breeds. In land of origin his strong constitution is famous. We have experienced that the West Siberian laika rarely visits the vet other than for his yearly vaccination, and can live until old age. (West Siberian Laiki from 14 till 17 years old are no exceptions). Of all dogs, which are officially X-rayed, till now (all our breeding dogs and their descendants), we can conclude that until now (2010) we had no hipdysplasia problems. Other breeders do not always check the hips but, besides cases of hipdysplasia in Scandinavia, we heard no signs of hipdysplasia in the breed. Also inheritable eye diseases, are officially checked right from the first imports. It’s a pity that we have to mention that Dr Stades discovered RD (a disease which can lead to blindness), with an import dog from Finland. From this country two dogs are imported, both with inheritable eye diseases. From an import dog from Czech is known he had cataract. In contrary to the two Finnish dogs mentioned before, the Czech dog is luckily not used for breeding. There have been different cases of epileptic Laiki. Some explained by the university of Utrecht as side effect because of Carre disease in a litter, others not examined or explained. Epilepsy can be primary or secondary (as result of another malfunction like an infection). It is a very unclear subject. Some dogs can become very old with this malfunction, but if not treated right or in a very strong case it can even be life threatening. Investigation to inheritige of this malfunction has not given results. Investigation in other countries haven’t given any results of problems. In Hungaria their was one single case, were there were three cases in one litter (in no other litters with this breeder) when used an Hungarian female and a male of origin from the Netherlands. We are the only West siberian laika kennel in the Netherlands who have bred with combination of dogs, who have no relationship to the first dutch breedinglines. So if their should be a risk of heritable form of epileptic, we are till now (2011) the only kennel with descendants of totally unrelated combination. Before mentioned malfunctions cannot be considered as breed-malfunctions because of their individual character and considering the few individuals (in which we must mention that every ill dog is one to many). But breeding and buying a dog you must stay alert on the health. Breeders who mention that they will never have malfunctions in their lines are suspected inexperienced, suspected naive or just suspected. Dogs with the before mentioned diseases should of course be excluded from breeding! And also great care should be used with their relatives. Only by paying attention not only to the positive things but also the negative ones, recognize them in an early stage, investigate and handle with care, the nowadays very good health of the West Siberian Laika, can stay as healthy as since prehistoric time. Compared to many ‘modern’ breeds, the West Siberian Laika is a healthy type of dog, which, up until now, has no breed specific diseases. 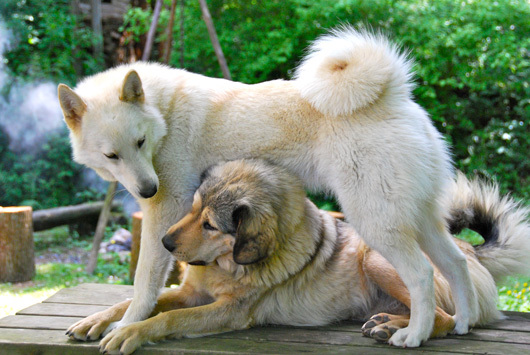 The West Siberian Laiki in our countries, appear to be dogs with a strong personality. They are intelligent, lively en playful dogs with a more than average need of activity and a big desire of human companionship. Although the West Siberian Laika has enough guard dog capacities to guard the house during your absence and will protect it’s family in case of emergency, he is very social to humans kids included. Usually visitors will be greeted very friendly. The West Siberian Laika is a dog for people who like an active outdoor life, in which he can for fill his demand of activity outdoors and show his calm and quiet temperament indoors by lying for hours in the presence of his people. The West Siberian Laika is excellent company for horseback riding and long hikes. But he also loves to accompany you to town or a restaurant. The West Siberian laika is not suited for people who both work fulltime away from home. The West Siberian Laika has well developed natural instincts, which demands a good education. When properly educated a West Siberian Laika has no problems living together with other pets and walking of leash in a natural surrounding. 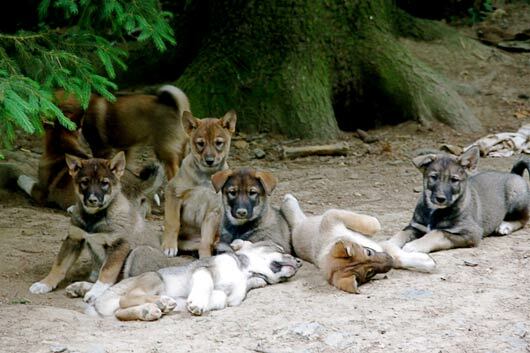 The females are, besides some exceptions, all very social to other dogs and playful till high age. The have many smart tricks. Dogs of 14 years old can still be encouraged to play, and dogs of 12 years old still enjoy working. This also illustrates that a West Siberian laika stays active for a long time. Male dogs are very social to females, but are in Western Europe (due to their raising?) more often dominant to other males. In other countries (were dogs walk more of leash?) I meet much more social males. With a good socialisation and education males are not fighters. Though if attacked a Laika can defend him selves very well. The West Siberian Laika is mostly easily corrected by voice, and a harsh training is not desirable and unsuited. Usually they have no problems to learn quickly what you want from them. Exceptions excluded they are obedient to their owners as well as other family members. Although a West Siberian Laika can stay in a kennel every now and then he is, because of his social needs, not suited for living as a kennel dog! Or being alone al day without human company. This can result in barking or independent behaviour, because if the dog has to entertain him selves al day, he will do this, also in the short time, when you are there after work or in the weekend. If you have more than one dog, the attachment of a Laika can, in some cases, even result in jealousy. It is up to the owner, if he has more than one dog, to keep order and peace, by being strict. So one can enjoy the playfulness and friendliness to other dogs of the West Siberian Laika. The West Siberian Laika loves his people, they are his pack and he loves them more than a dog pack. If the West Siberian Laika is accepted as a family member, he will for fill this task excellent. Family and friends will be announced and greeted friendly. A West Siberian Laika is calm very attached company that should be always friendly to its people. In general one can say that a West Siberian Laika is, if the owner possesses the same qualities; active, well balanced, loyal, friendly company. In November 1987 in Tomsk (Siberia), on a state property breedingcentre owned by the ministry of hunting an fishing, Tom was born a dark wolfgrey West Siberian Laika of the pure Chanteiskaja Laika-type. Tom was imported to the Netherlands in 1989 by Chris van de Vlasakker Eisenga (with good help from friends like Chris Janelli and Erna Anthonis). 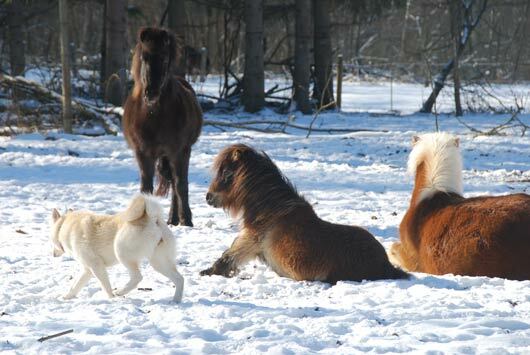 This was the beginning of the West Siberian Laika in the Netherlands. After two years of nagothegation, waiting and being desillutionated several times (importing dogs of good quality was very difficult), she imported also from land of origine the female Taiga. With these two dogs we could make an excellent start in the Netherlands. They both seemed to be excellent representands of their breed, from exterior as also their workingcapacities. There obedient, friendly kcharacter and their easy adaptation did not stay unremarked. They were a very welcome contribution to the polardogworld. Until 1999 they entire population of West Siberian Laika in the Netherlands (about 60 dogs) were descendants of these dogs and new imports made by Chris van de Vlasakker Eisenga out of Slawakia, Hungaria, Ukraine, Latvia and Russia. because of that a lot of ‘fresh blood’ came to the Netherlands and even as small as the population was at that time, there were big breeding possibilities because there were descendants of 15 diffrent breedinglines available. PS As post scriptum, a little tail, in which I would like to answer a question much asked to me by Laika- and other Nordic breeds lovers. Why is the tail of the West Siberian Laika curled and have most primitive dog breeds a curled tail compared to less ‘natural’ dog breeds like for example shepherd dogs? The answer that I got from E. Thrumler was, that in times of domestication of dogs, the dog got also exterior differences compared to his wild ancestors. One of these is the curling of the tail. Primitive breeds which have a curled tail are therefore closer to this process. Nowadays breeds which have no curled tail, have this because of human selection. If breeders stop selecting for this, than you can notice that the tails start curling again, like you can see with many mixed breed dogs. Thrumler thought of all breeds the Laika type dogs were the most original ones and therefore had a strongly curled tail. It is natural for a dog to have a curled tail: so just typical dog!